That scenario played out again and again during Cambodia’s horrific Maoist revolution, leaving the countryside bereft of medical facilities and the country overall in dire need of experienced doctors and medical technicians. Now that peace and democracy have been restored in the country, the GE Foundation has stepped in to help Cambodia bring its medical facilities up to speed. 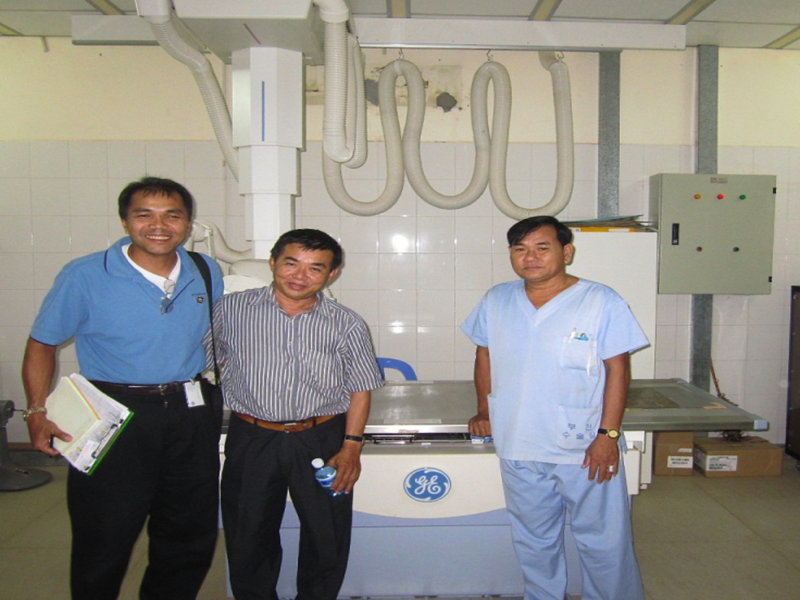 Developing Health Globally™ (DHG), in partnership with the Ministry of Health in Cambodia, has provided crucial medical equipment in key areas, including casualty wards, ICUs, operating theaters, labor and delivery wards, nurseries, radiology units and labs. Because every developing country that the GE Foundation supports is unique, understanding the local context is a crucial part of the work. Although the civil war with the Khmer Rouge ended in 1975, the land mines are still there. One hospital in Kompong Speu, near where a subsequent guerrilla war dragged on into the 90′s, still regularly receives patients with land mine injuries. To compound the stress on limited resources, a boom in the availability of motor bikes and cars has brought a drastic increase in traffic accidents. The new ER equipment, made possible by GE support, is significantly improving trauma and emergency care. Dararith’s family eventually escaped to Australia. Now that the hostilities are history, he has returned to his homeland and is the country manager of GE’s Global Growth Operations, a key partner on the ground for the GE Foundation team, helping manage the partnership with the Ministry of Health. The GE Foundation also engages “GE ambassadors” for its recipient countries: volunteers who work with the GE Foundation team to build relationships with DHG-supported hospitals and build sustainable practices. Rod Sou, a biomedical technician with GE Healthcare at Florida Hospital in Tampa, has been a GE Ambassador to Cambodia for three years now. Another refugee of the Pol Pot purge, Rod is part of a team of volunteers from GE’s Asian Pacific American Forum (APAF) who check in on more than 30 facilities in 24 provinces that DHG is supporting. GE ambassadors partner with medical directors in Cambodia to make that human connection and help them to adopt—and adapt—best practices. The impact of all of these efforts has been swift and profound. Doctors are treating more patients, and with better outcomes, which in turn brings in more patients. In lieu of home remedies and folk medicine, or having to travel to neighboring countries, more and more of Cambodia’s population is seeking care at local hospitals and clinics. “When I walk into their Emergency Rooms now, compared to what they had, it’s like going from the stone age to the jet age,” says Rod. Doctors now have the ability to monitor vital signs during surgeries, something taken for granted in the developed world. Alarms and alerts now warn surgeons and clinicians of urgent anomalies. Both mortality rates and recovery times have been reduced. But there remains a shortage of doctors. A legacy of the bloody revolution and its Maoist purge of intellectuals is a severe shortage of physicians and nurses, as well as technicians who can operate the new machines and keep them in working order. This June, the GE Foundation and Cambodia’s Ministry of Health announced the launch of a national biomedical equipment technician (BMET) training program developed in partnership with Duke University and Engineering World Health. Technicians in training will participate in both classroom and laboratory instruction, with a strong emphasis on hands-on training. Two important local partners championing this effort are Calmette National Hospital, as it becomes a Center of Excellence in the public health system, and the University of Puthisastra, a local educational partner that will help provide the program and the country with future technicians. Gathering feedback and support from in-country experts and building local mentors across the Ministry of Health hospital system is a highly valued aspect of the Developing Health Globally program. The GE Foundation team works closely with its local partners and international NGO experts to leverage the experience and expertise it has acquired through its work in fifteen countries. Creating centers of excellence and local champions is both a challenge and a breakthrough in a culture in which speaking up and asking questions might have gotten one killed in the all-too-recent past.